Located in picturesque northwest Wyoming is one of the nation's most beautiful parks, even its name speaks volumes: Grand Teton National Park! 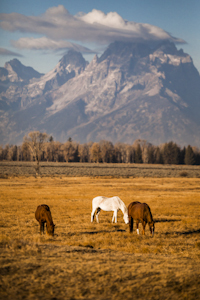 Rising more than 7,000 feet above Jackson Hole, WY, the Teton Range dominates the landscape. Iconic views of these magnificent mountains are practically endless. 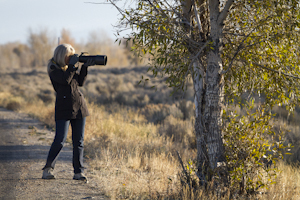 Beautiful landscape is not all the Grand Teton has to offer; wildlife is plentiful and equally as spectacular. 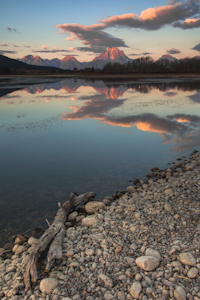 The park is located just south of Yellowstone National Park and north of the charming town of Jackson Hole, WY, which is a destination in and of itself, with its exquisite galleries and divine dining. 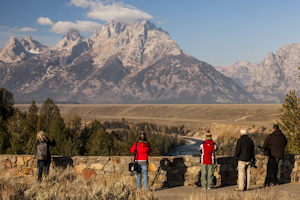 Jackson Hole is the perfect place to stay while visiting the park. Aperture Academy instructors, Ellie Stone and Scott Davis, met up with their excited students in the Jackson Hole hotel lobby. The meeting was set in the cozy lobby over a nice glass of wine. Scott and Ellie like to learn each student's skill level and expectation for the workshop, so they can ensure that everyone acquires the skills and experience they desire. The instructors also went over a basic itinerary, so everyone would know what to anticipate over the following two days. 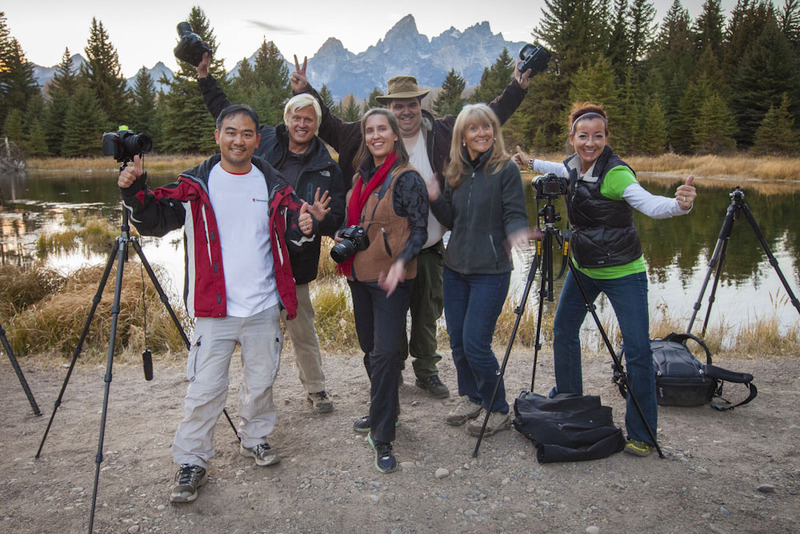 After some fresh hot coffee in the hotel lobby, the group headed out for the first of many iconic destinations, Oxbow Bend. 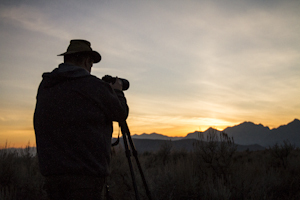 Just before sunrise, Scott and Ellie placed all the students into position and assisted with camera settings, as well as the use of graduated neutral density filters. Mother Nature was feeling generous on this beautiful morning, providing just enough clouds, with a wondrous amount of pinks and purples displayed. The day was definitely off to a magnificent start. En route to the next photographic location, Ellie and Scott noticed some horses in an open pasture, quite close to the road. They took advantage of the opportunity, and the group took a short walk along the fence line. Not only were the horses beautiful, the backdrop was spectacular. 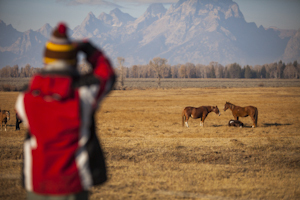 Grazing horses in front of the spectacular Teton mountain range, who could ask for more? 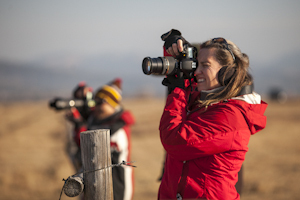 The instructors assisted with some compositional basics and encouraged the use of a telephoto lens, in order to gain compression and achieve that massive mountain feel. 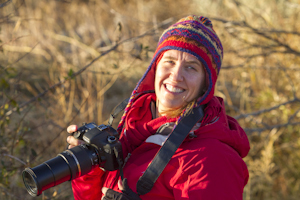 Once everyone had captured some fantastic images, it was time to move on to the next locale. 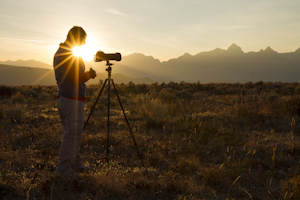 Ansel Adams had immortalized the next shooting location, the Snake River overlook, which includes a magnificent view of the Tetons with the Snake River winding in the foreground. Ansel's image was captured back in 1942, so the trees have grown in quite a bit since then. Nevertheless, it's well worth the stop. 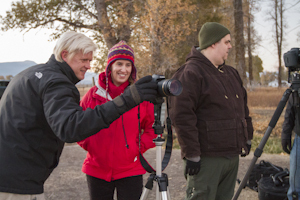 Scott and Ellie assisted the group in capturing their own unique images from the astonishing location. The morning had been action packed, so as bellies rumbled, it was time for a much needed lunch break. After the afternoon break, a little bit of walking felt pretty good. Scott and Ellie took the students out to a setting with some old barns. This was the perfect opportunity to think in black and white. Old barns and monochrome seem to go hand in hand. Of course, the beautiful Teton Mountains don't hurt as backdrop. The instructors encouraged the students to change up their point of view and try new and dynamic compositions. The creative juices were flowing, as Scott and Ellie witnessed on the students' LCD screens. Next on the agenda...wildlife. It didn't take long for the group to find a nice group of pronghorn antelope. A male pronghorn was trying to keep his seven females in a tight group. Scott led the group slowly and steadily into the field for some fantastic image opportunities. 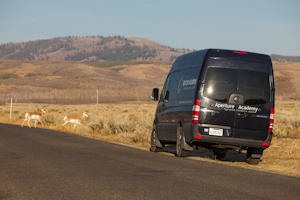 It takes time and patience when dealing with wildlife, especially antelopes, as they can be fairly skittish. The persistence and patience paid off as everyone captured outstanding images of the beautiful and graceful animals. As the sky started to glow with some pre-sunset wonder, the group made their way to an open field that contained some colorful aspen trees and a herd of bison off in the distance. Once again, the use of graduated neutral density filters helped to balance the exposure in camera, which minimizes the time one spends in front of the computer doing post-processing. Just when they thought the color was going to start to fade, it continued to get more intense. It was a delightful end to a fun and productive day. 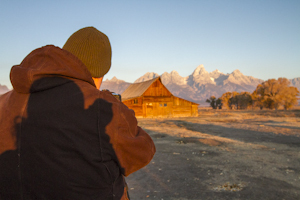 Day two began with another iconic sunrise location, the Molton barn, on Mormon Row. On any given day of the year, you'll find photographers lined up to photograph this picturesque scene. This day was no different, as three photographers had already staked their claim on great positions before the morning sun had even thought about making its appearance. 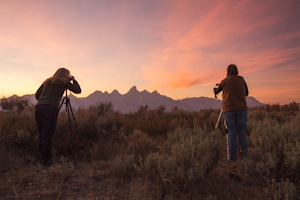 With their early arrival, there was plenty of time to choose a good position and get the camera settings all dialed in before the brilliant morning sun illuminated those extremely photogenic Tetons. Scott and Ellie offered their students some different composition ideas, as well as showing the more commonly used. 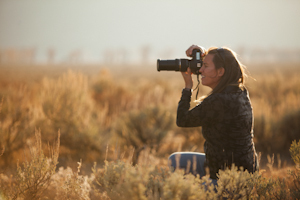 The instructors encouraged everyone to move around and try multiple vantage points, to expand their photographic horizons. 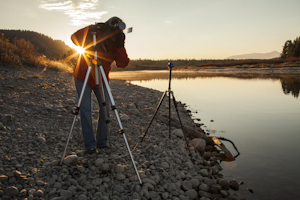 Once the best light had faded, it was time to try the search for some wildlife. 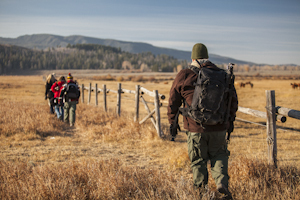 Ellie and Scott drove the students to some of their best locations for moose activity. Almost right away they spotted a large moose cow in the sage-dotted landscape. The morning was chilly, which turned out to be the perfect conditions to photograph the stunning creature. As she exhaled, her breath was illuminated by the soft morning sunlight. It was an amazing experience and such a fantastic way to continue the day. Scott and Ellie quietly walked around to all the students to be sure that everyone had the proper settings in the low light situation, to ensure they would capture the action. Memory cards were filling and batteries draining, which is a sure sign that a lunch break was in order. 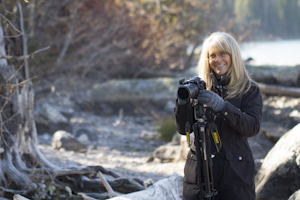 After bellies were filled and batteries charged, it was time to head out for the final afternoon of photography. 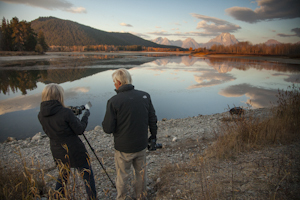 Scott and Ellie escorted the pupils to Jenny Lake for some lovely afternoon reflection images, while demonstrating the proper use of polarizing filters. 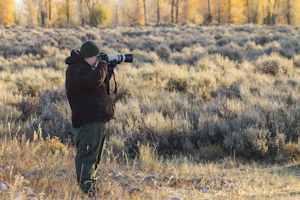 After capturing some fantastic shots, it was time to search once again for wildlife. 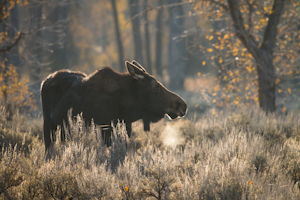 It seemed as though moose were a hot topic on this day, as they soon located another large female. Upon the initial sighting, she was hidden within some trees, but Scott reminded that time and patience would yield some pleasing results. He was right, because as most people had started to leave, the cow made her way into the adjacent pond. The behavior was perfect for some spectacular and unique images, as she fed on the pond's algae; her reflection in the pond was stunning. All were giddy to sit and not only photograph, but also watch the natural behavior. Memory cards were definitely filling as the sun was dropping ever lower in the sky. The changing light was the group's clue to move on to the sunset location. 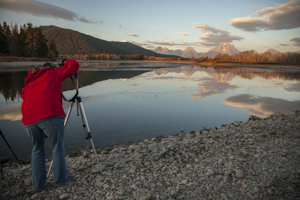 Scott and Ellie had saved one of the best spots in Grand Teton National Park for last... Schwabacher Landing. 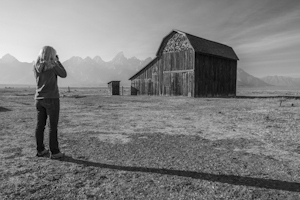 The location is highly recognizable, as it's been captured by many a photographer for many years. Gorgeous pine trees line a smooth-as-glass beaver pond, allowing the Teton Range to be reflected with stunning beauty and detail. Once again the instructors assisted with the use of filters and also changing vantage points to capture some differing angles of the scene. As the last of the day's light faded, a single cloud formation appeared to take the shape of a fiery phoenix. 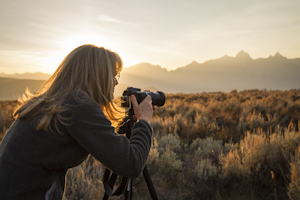 What a unique and exquisite way to cap off the Aperture Academy Grand Teton Workshop. 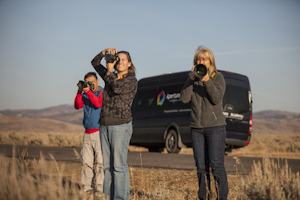 Scott, Ellie and the rest of Aperture Academy team!